Imagine the dinner party scenario: Hours of work in the kitchen; hours of enjoyment around the table; hours of sleeping it off; and, when you get up in the morning, a kitchen that smells like it never happened. 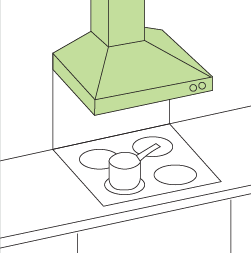 That's the test of a great rangehood and your new Robinhood model will pass with flying colours. 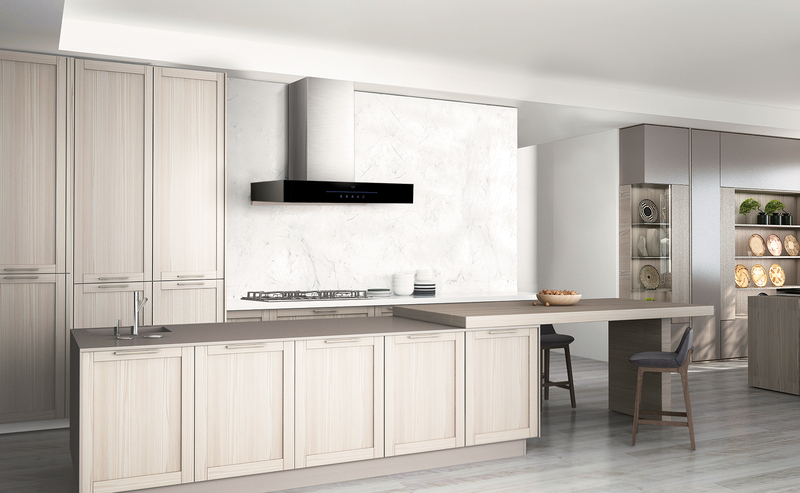 We can't give you a definitive answer to the question "which rangehood would be best for me? ", because so much depends on personal taste. 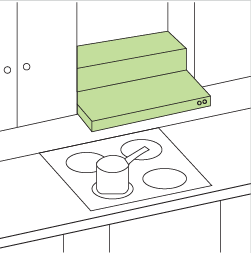 However, we can guide you towards the categories of rangehood that best fit your needs. 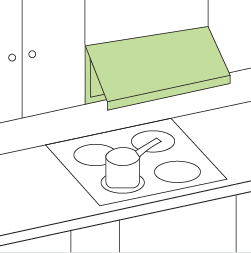 This type of rangehood is positioned against a wall over your cooktop. Air is usually ducted to the outside of your house through the wall or roof, although some models offer a recirculation option. Wall canopies are known for their excellent performance. Creative cooks need maximum extraction power so that they can sauté, chargrill and stir-fry through an ever-growing repertoire of dishes. Anything involving high heat (steaks and grills); high seasoning (curries, stir-fries); or high potential for odour (salmon and other types of fish) will permeate every room of the house unless you have a powerful rangehood on the job. A family kitchen is seldom at rest. At breakfast time it’s churning out everything from bacon and eggs to incinerated toast. At dinner time, meals range from pungent stir-fries to good ol’ meat and steamed veggies. When your kitchen is about high productivity and fast turnaround, you can’t skimp on extraction power. For some people, a kitchen is a just kitchen - not a means of self-expression. Often nothing gets cooked because you’d rather eat out. If your cooktop is mostly used for reheating, boiling and steaming, with maybe the occasional dash of high heat frying, you can choose to have a lower level of extraction power. However, if you just love the look of a canopy hood, don’t let us stop you! RECOMMENDED EXTRACTION POWER - 500m3 or more two bends, choose the highest extraction level you can afford. or Australia 1800 648 556. Powder-coated and stainless steel surfaces of your Robinhood rangehood should be regularly cleaned with a clean, damp cloth (washable micro-knit cleaning cloths are ideal). Specialised stainless steel cleaners and spray on cleaners are safe, but avoid using regular abrasive cleaners because they could damage the surface. If your rangehood is ducted (air is expelled out the wall or roof), the micromesh filter needs to be cleaned at least once a month - more often if you regularly cook with oils, butter, garlic and spices. Clean the filter gently with a dishwash brush in a sink full of hot water and detergent; alternatively, you can put your filter through the dishwasher. Some discolouration of the filter frame may occur if washed in the dishwasher. You should also clean the area that becomes visible when you remove the filter. This is best done with spray-on cleaner and a sponge or paper towels. Always disconnect the power supply first. Do not use the hood without filters. If your rangehood recirculates air through a special charcoal filter, you will need to replace the filter regularly. We recommend replacement every two to four months, depending on how much cooking you do. Replacement filters are available from Robinhood stockists. Fully saturated charcoal filters can become a barrier to air movement and limit the performance of your rangehood; they can also be a fire danger when laden with grease. The light bulbs on all Robinhood rangehoods are easily replaced. 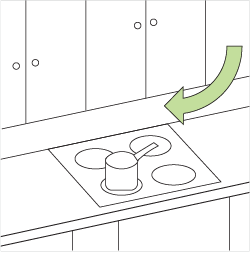 Instructions can be found in the operating manual that came with your rangehood. Replacement light bulbs can be purchased from specialist lighting stores. It's a good idea to bring the expired bulb with you, so that you can obtain an exact match. 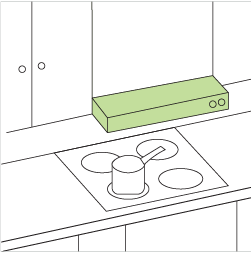 Air extraction is the primary reason to get a rangehood, but lighting comes a close second. Being able to see what you’re doing is important. Is it simmering? Are those onions brown enough yet? Do I need to flip that steak? With effective lighting, the answers are obvious. Our rangehood line-up includes four types of lighting: LED, fluorescent, halogen, and incandescent. All are effective, but each type of light has different qualities, colour, light intensity and bulb lifespan. Fluorescent, halogen, and incandescent bulbs are available from any good lighting store. LED bulbs are available from Robinhood. New generation fluorescent lighting provides outstanding illumination of the cooking area and generates very little heat. And Robinhood fluorescent light has a special benefit - it’s dimmable! You can select a level of light that works for you, then dim it further for mood lighting when you’ve finished cooking. Don’t feel bad about leaving the lights on, even all night, because they’re very cost-effective to run. The u-shaped bulbs are easy to replace and can be purchased from any good lighting store. Halogen light is bright, white and focused - very good for reading the fine print on ingredient packages! This lighting style is slightly more energy efficient than standard incandescent light, but not as energy efficient as fluorescent light. The bulbs get quite hot because they generate heat as well as light. 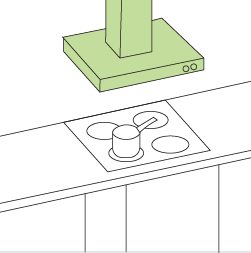 Most rangehood models with halogen lighting have two bulbs, but some have four. Replacement bulbs can be purchased from any good lighting store. Incandescent light is generated by what you probably call a ‘normal light bulb’. It has a softer, more golden light. The bulbs get quite hot because they generate heat as well as light. While incandescent is the least energy-efficient type of light, the bulbs are relatively cheap. You’ll find this type of lighting at the lower end of our range. Replacement bulbs can be purchased from any good lighting store. LED (light emitting diode) lights are very energy efficient. They generate hardly any heat, which means that nearly all the energy they consume is turned into light. They also last a long time - up to 50,000 hours (that's about 50 times longer than your average incandescent bulb). The bright white glow of LED lights is shining an eco-friendly path to the future. Where does the dirty air go? Exit to the outside through the ducting that connects your rangehood to the exterior of your house. This is the preferred method of air removal. Recirculate through charcoal filters, which clean the air before it’s returned to the kitchen. This type of air removal is only used when ducting isn’t possible because of how the kitchen is configured. Ducting is the preferred method of air removal. It is more efficient and quieter. Ducted rangehoods use aluminium filters to catch large particles of fat and grease before expelling steam and odours to the exterior of the house - either through the wall or roof. The filters are washable in the dishwasher and regular washing is important to ensure that they don’t inhibit air movement. The shortest and most direct route to the air exit point will be the most efficient. Recirculation should only be used when ducting is not possible. With recirculating rangehoods the air is cleaned before it’s recirculated into the kitchen. The air travels through charcoal filters which absorb odours, grease and steam. Charcoal filters need to be replaced regularly (every two to four months) or extraction performance is impaired. The filters cannot be washed and re-used.